Yixing Chinese Tea Pot - Stone Dipper Rustic | No reviews for this product. 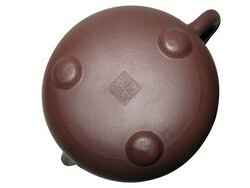 A purple clay (Zini) Yixing Chinese tea pot of the rustic Stone Dipper design. This pot holds 340 milliliters and comes with 2 cups. The word "Shipiao" means Stone Dipper. This design is my all-time favorite. It belongs to a style called 古拙, which can be translated as "old and dull". A more meaningful interpretation may be "rustic simplicity". The shape of the design resembles a piece of stone. Broad at the bottom and narrow on top, it feels stable. The bridge on top is tiny but highly symbolic. The simpler the design, the harder it is to make. Within the confine of simplicity that potter has to convey a spirit of conciseness, elegance, rationality and captivation. From this point of view, I think the maker of this pot - Zhu Xinnan （朱新南） has really done well. It is one of his prize-winning design. It won him a bronze medal in the 4th China National Level Artistic Competition. The clay comes from the original clay mine of Yixing County: Huanglong Shan (Yellow Dragon Mountain). It is a high quality purple clay (Zini) that has been left to weather for 25 years before being crafted. It has a naturally subtle, jade-like luster that can feel warm and friendly with repeated use. It feels a bit like an old friend greeting with a smile. HQ has an identical pot like this. According to him, even without the initial intensive seasoning, it takes just one week for this pot to acquire high level of smoothness and luster. This pot holds 340 milliliters and is suitable for 4 people drinking. It comes with 2 Yixing cups. One characteristic of this pot is its large surface area. The body has much artistic value. A lifetime of ease and carefree exists only in the smoke and steam of tea kettle and tea cups. You can also find Mr Zhu's seal at the bottom of the pot. The four characters says "Zhu Xin Nan Make". The five most detailed customer reviews are shown below. Alternatively, you can No reviews for this product.. This Yixing Chinese Tea Pot has 9 holes behind the mouth. We have tested it according to the guidelines of How to Buy Chinese Tea Set and found that it passes all the tests prescribed. This tea pot will come with 2 cups made from lower grade Yixing purple clay. The price includes courier shipping. For US and Western Europe, it will take 5 to 10 days to arrive. No other shipping charge is payable. Mr Zhu Xinnan was born in 1957 in Yixing from a long line of potters. He graduated from the Jiangsu Industrial School in 1980, before taking up apprentice in Yixing Pottery Factory to learn creative design. He enrolled in Central Institute of Art and Craft from 1992 to 1994. Three years later in 1997, he was awarded "China Outstanding Young Potter". He went on to specialize in Yixing designs for the last 20 years. In China, he is highly regarded for his non-decorative, classical designs. He currently has two Yixing titles. One is a National Level Assistant Craft Master (国家级助理工艺师). The other is Craft and Art Master (工艺美术师). Although there are ten of thousands of potters in Yixing, only a few hundreds can be regarded as masters with official titles. 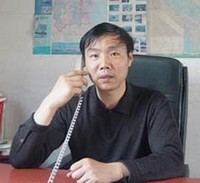 Mr Zhu is one of them, which speak a lot of about his caliber and standing in China.